Let’s take a closer look ………….. Frustration is the emotion we feel when things are not going our way, when we are not getting what we want or when we feel we are not being listened to. When we cannot get our message or need across, or a situation cannot be resolved, we become frustrated. Unresolved frustration, can lead to apportioning blame on another (often someone who is unlikely to bite back), and is often a trigger for anger. Many people do in fact have a low tolerance to frustration, but when feeling it, it can prevent (a plan, or action) from progressing, succeeding, or being fulfilled. It can also prevent (someone) from doing or achieving something, leaving someone to feel dissatisfied or unfilled. Anger is a strong feeling of annoyance, displeasure or hostility and is generally what we feel when we come up against unresolved frustration or injury which may not always be our own issue. It may be a consequence if a person or thing we love is injured or hurt. It can though, encompass all levels of our entire being. Some cases of anger are beneficial whilst others cause misery and harm. Aggression is being hostile or showing violent behaviour or attitude and can be very forceful. It can be the action of attacking without provocation and can be defined as “an action with intent to cause harm”. 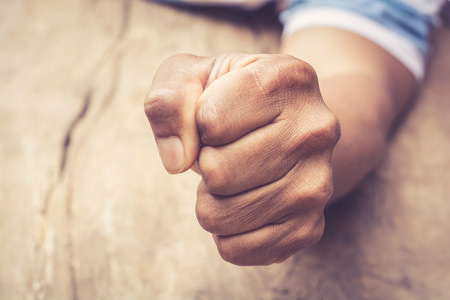 Aggression does not have to be physical and in reality verbal aggression is perhaps a safer way to cause harm than physical attack but can be just as damaging over a longer period of time. It can be said that generally the average toddler is well adept at showing anger and from this we can deduce that it is slightly inherent in us, we are born with a basic ability to be, and show our discontent in order to get our needs and wants met. Things appear to evolve from there. If you look at the Frustration-Aggression Hypothesis which was introduced by Dollard in 1939 it seems there was an agreement with Freud in the idea that aggression is an innate response, but uses the idea of learning certain behaviours……. The idea of a defence mechanism at its core principally is that our consciousness and our internal models/views of the world are systematically distorted in order to avoid anxiety. Freud proposed that individuals used a number of subconscious coping strategies to deal with negative thoughts and emotions. These would be emotion-focused strategies which do not change external stressors and reality. Therefore, the use of defence mechanisms is not in itself “bad” or “unhealthy”, but some are certainly more harmful than others. Sometimes “an indentification with the aggressor” involves identifying with and behaving like, an individual who has done harm. For example, the little boy or girl bullied at school, then becomes the bully themselves, or an abused child becomes the abuser. This defence serves to empower the individual, making him or her less prone to anxiety from external attack…………..……or in the words of Anna Freud …..”by impersonating the aggressor, assuming his/her attributes or imitating his/her aggression, the child transforms him/herself from the person threatened into the person who makes the threat”. Freud further believed we must not ignore our aggression but put it to good use, for if we do not do this it would build and seek discharge in some other, perhaps in a more destructive way. The translation of frustration into aggression is dependent on learned behaviour and the presence of external cues that act as triggers to them. Anger does not remove pain, it disguises it, mutating it into something that makes the person feel better temporarily. The pain doesn’t go away, it lurks inside and leaks out affecting every part of the person’s life and the ability to reach their potential. Anger does not remove vulnerability, it just makes it dangerous. Anger is not always violent, but if left unchecked for whatever reason, it can become destructive hostility that preys on the person as well as the target. This can affect health, both physical and mental and leads to caustic and often addictive behaviours. From another perspective, it is comforting to know that none of us are born with this mechanism of “chronic protection”…. we learn it, sometimes accidentally. The subconscious then recognises it as a useful behaviour. The “someone” we choose to mimic, gets their needs met by being angry. The person then gets increased power with increasing violence in their reactions. However, through counselling you can realise that this behaviour is not part of you and is something you can change to improve your life, otherwise it continues to get in your way instead of dealing with it so you can enjoy your life in a more constructive way. As a caring, friendly and approachable therapist, I have helped many clients explore and understand their fear(s) which have ultimately lead to a life of continued frustration, anger or aggression. I do this by offering you the respect, attention, space and support required whilst managing your issues, as together your thoughts and feelings that have created this turmoil or suffering in your internal world, are explored. This allows you to have the time to reflect and understand yourself better and your situation as you are able to identify where this all comes from. Sessions are offered in an environment which is confidential, open, empathetic, congruent (genuine) and non-judgemental warmth. By restoring balance and regulation back into your life you can grow, evolve and move forwards in a more tolerant, positive and confident manner. Pause for a moment and consider the consequences of not dealing with frustration, anger or aggression and how perhaps, in later life an anger issue still evolves within you, waiting to explode at another time, as any continual childhood abuse may have caused you to swear you will never feel vulnerable again. Often this is very over-generalised…………so why suffer any longer, surely it would be wiser and kinder to enjoy yourself enabling you to live or achieve your full potential. If I can make this change possible for you, please contact me by emailing belinda@breathofchange.org.uk, or calling 07973410375/02088732843. I operate from clinics in Epsom, Surrey and Crawley, West Sussex.